Below you are going to find a pictorial account of a peachick from the pipping of the egg, to hatching, then to the brooder, and as a growing chick. All photo's courtesy of Linda Pravel, my better half. To begin this pictorial we will start with a picture of incubators loaded with eggs of different species. The one on the left has a turner installed, the one on the right is a picture window incubator that I use as a hatcher. And now just to give you an idea of the sizes of eggs. If you would like to view a larger version of this image, click on it. The egg on the left is a peafowl egg, the two in the center are a ringneck pheasant egg and a chukar partridge egg. The egg on the right is a button quail egg. The next several pictures are going to show different stages of the pipping and hatching of the Peafowl egg. If you would like to view a larger version of each image, just click on it. The egg beginning to pip. The chick will then turn inside the egg, chipping the shell as it turns. As the chick completes the turning and pecking of the shell, the cap of the shell is pushed open as the chick emerges. This next set of pictures shows the completion of the hatch. Again, if you would like to view a larger version of each image, click on it. The chick emerges from the shell as a rather wet little bird completely free of its containment. The chick needs to stay in the incubator until completely dry. This image shows the peachick hatched and drying off in the incubator. The rest of the pictures on this page are full sized. This image shows the peachick one hour after hatching. This newly hatched peachick still needs drying in the incubator before being placed in a pre-warmed and set up brooder. This image shows a home made brooder with a light bulb heat source, the cover is open. The peachick hatched above is in a brooder with a yellow golden pheasant hatched a few days earlier. The Yellow Golden chick will help teach the peachick to eat. The marbles in the water attract the peachick to pick at them, teaching it to drink. The next few pictures are of "Pete" the peachick at about five weeks of age. Pete has turned into an inquisitive peachick. She is extremely tame and enjoys the company of people. I think Pete is also a ham. Pete likes to have her picture taken. I will be adding more pictures as "Pete" becomes older. This is the last picture we have of Pete. I am very sorry to say that our beloved "Pete" the peachick became ill and died at seven months of age. We love her and miss her very much. Each morning, when she heard we were awake, she whistled extremely loud until we let her out of her cage. At night, it was difficult getting her back into the cage. Petie, along with the cat, would greet Linda at the door when she came home from work. Petie sat on top of the desk next to the monitor or on the back of my chair when I worked on the computer. Petie enjoyed being around people. Visitors to our home also got a lot of enjoyment playing with her. We gave Petie the best life possible. In the short time we had her, she bestowed a lot of pleasure. Peetie's memory will last us a lifetime. We now breed India Blues, Black Shoulders, Emerald Spauldings, Blue Pied and White peafowl. They will never be as tame as "Petie" but we enjoy them very much. 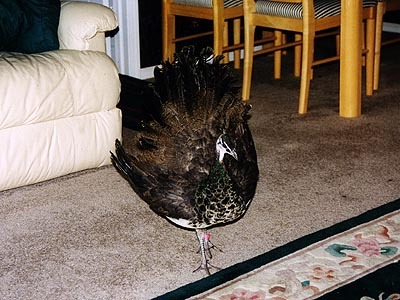 This page is dedicated to the memory of "Pete" the peachick. We hope you enjoyed sharing a few moments with Petie.